Delicious, packed with Mediterranean flavours and covered in a rich and thick tomato sauce! This is a warming and extra hearty Greek dish, perfect for a cold evening! This traditional soutzoukakia recipe was introduced to the Greek cuisine in the beginning of the 20th century and has its origin from the city of Smyrni or modern day Izmir. The secret ingredient that makes these meatballs (soutzoukakia) unique is nothing else than cumin. Cumin is a very fragrant spice that will soak through the meat and infuse it with its unique aroma, but be careful, use in moderation as it can be a little overpowering! To prepare the soutzoukakia, knead all ingredients together and leave the mixture in the refrigerator for 1 hour. Shape into oblong meatballs and shallow fry gently in oil till golden brown. Alternatively for a lighter dish, bake the soutzoukakia till golden brown. To prepare the tomato sauce for the soutzoukakia, sauté the onion in olive oil. Add the squashed garlic and fry for 3-4 minutes until the onions are tender. Add the wine, the tomato juice, sugar, cumin, tomato paste, the bay leaf and season with salt and freshly ground pepper. Bring to a boil and simmer, until the sauce starts to thicken. Add the fried/ baked / grilled soutzoukakia in the tomato sauce and stir gently, being careful not to brake them. Leave to simmer in low heat for 15 minutes, enabling the meatballs to absorb all the wonderful flavours from the tomato sauce. 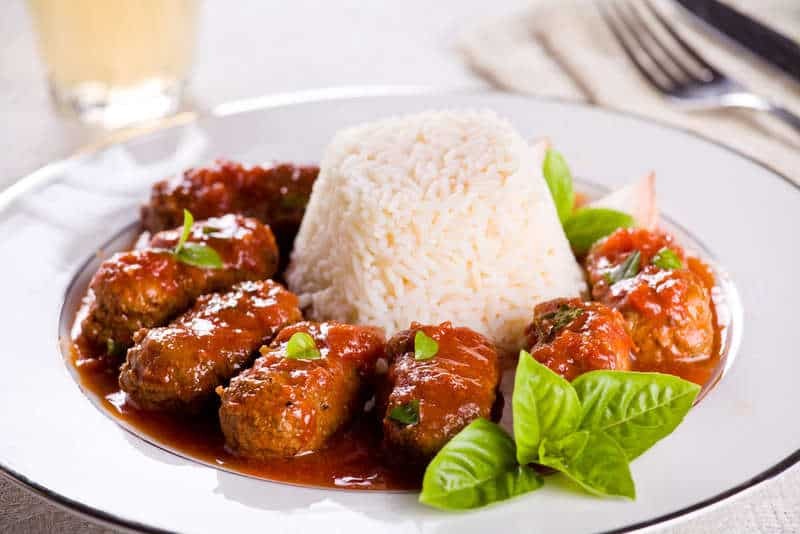 Serve the soutzoukakia (baked meatballs) while still hot with some rice or mashed potatoes and lots of tomato sauce. Enjoy!! I would like to try this recipe but I am not sure if it requires ground cumin or whole cumin seeds? I have young children at home. What’s a good sub for the red wine? This is fabulous! Made my kitchen smell like a wonderful Greek restaurant I remember during my days living in Worcester, Mass years ago. Easy to make. I love your website. Thank you for all your hard work! Hi there! It depends how strong you like it. I have always used 2-3 teaspoons which is about 1 tablespoon but appreciate that not everyone likes strong flavoured cumin taste 🙂 I have adapted the recipe to state that!